Flatfish are shallow water species, taken mainly by target inshore trawl and Danish seine fleets around the South Island. Flatfish Individual Transferable Quota (ITQ) provides for the landing of eight species of flatfish. These are: the yellow-belly flounder, Rhombosolea leporine (YBF); sand flounder, Rhombosolea plebeian (SFL); black flounder, Rhombosolea retiaria (BFL); greenback flounder, Rhombosolea tapirina (GFL); lemon sole, Pelotretis flavilatus (LSO); New Zealand sole, Peltorhamphus novaezeelandiae (ESO); brill, Colistium guntheri (BRI); and turbot, Colistium nudipinnis (TUR). For management purposes landings of these species are combined (FLA). The proportion that each species contributes to the catch is expected to vary annually. Because the adult populations of most species generally consist of only one or two year classes at any time, the size of the populations depends heavily on the strength of the recruiting year class and is therefore thought to be highly variable. Flatfish catch limits have generally been set at high levels so as to provide fishers with the flexibility to take advantage of the perceived variability associated with annual flatfish abundance. There are important recreational fisheries, mainly for the four flounder species, in most harbours, estuaries, coastal lakes and coastal inlets throughout New Zealand. Flatfish are managed by the Ministry for Primary Industries using the Quota Management System (QMS). 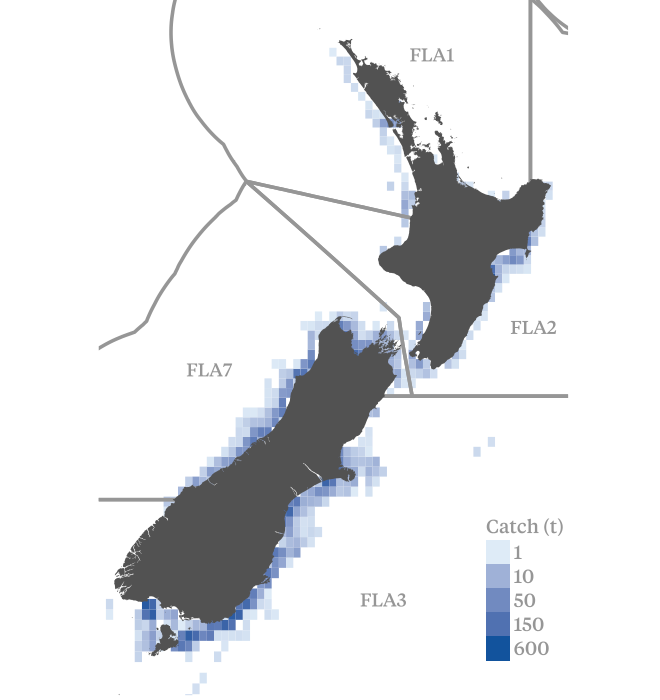 The risk assessment covers nearly 85% of all flatfish caught commercially in New Zealand. The most recent assessment of stocks in FLA 3 was undertaken in 2015. Assessments were made of all three main stocks (ESO, SFL and LSO) combined, as well as for each stock individually. The Ministry for Primary Industries concluded that it is about as likely as not that the stock is at or above the target, unlikely (<40%) that the stock is below the soft limit and very unlikely to be below the hard limit. Notwithstanding that, differences exist in the status of the individual species. While the combined stock appears highly likely to be above the point of recruitment impairment and probably fluctuating at or around a level consistent with maximum sustainable yield, there is less evidence this is the case for some species. Across the three main species of FLA 3, the Ministry for Primary Industries conclude that it is unlikely (<40%) that overfishing is occurring. If assessed separately, sand flounder and lemon sole would likely score low risk, and New Zealand sole either medium risk or precautionary high risk. No information is available on stock status in FLA 7. Target species (FLA 3) - Stable: Likely outlook appears to differ by stock. Sand flounder and lemon sole appear to be in good health and responding well to the Management Procedure. It is possible New Zealand sole are being overfished. Target species (FLA 7) - Uncertain: Likely outlook appears to differ by stock. Sand flounder and lemon sole appear to be in good health and responding well to the Management Procedure. It is possible New Zealand sole are being overfished.